Judith Ann Bertucci, age 75, of Naperville, IL, formerly of Berwyn, passed away on February 9, 2018 at Meadowbrook Manor Naperville, IL. She was born February 6, 1944 in Chicago, IL to the late Henry and Anne Mallick. Loving mother of Deborah (Kevin) Eng of Naperville, IL, and Anthony (Shelley) Bertucci of McKinney, TX; adored grandmother of Dakota, Anthony, Jr., Derek, Frank, Savannah, Nicholas and Thomas Bertucci; dear sister of the late Henry Mallick, Jr. and Dolores Mallick; best friend of Patricia Teichman; fond aunt and friend of many. Judith grew up in Berwyn, IL and graduated from Nazareth Academy in La Grange Park, IL. 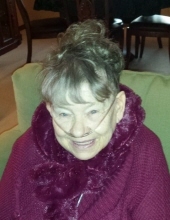 Most recently, she loved to spend time with friends at the Riverwalk Adult Day Services in Naperville. She especially enjoyed art and music in many different forms. For those who would like to leave a lasting tribute to Judith's life, memorials to Riverwalk Adult Day Services, 305 W. Jackson Ave., Naperville, IL 60540 Attn: Director, would be greatly appreciated. Visitation will be Friday, February 15, 4:00-8:00 PM at Friedrich-Jones Funeral Home & Cremation Services, 44 S. Mill St., Naperville, IL. Funeral Service will be Saturday, February 16 at 9:00 AM at the funeral home. To send flowers or a remembrance gift to the family of Judith Ann Bertucci, please visit our Tribute Store. "Email Address" would like to share the life celebration of Judith Ann Bertucci. Click on the "link" to go to share a favorite memory or leave a condolence message for the family.